Some dogs shed a lot. What can you do to help get the hair loss under control? Grooming is the key. Keeping in mind that the hair is going to fall out either way and it is best to remove it yourself and throw it in the trash, then to let the hair fall out naturally all over your house. The more hair YOU remove the less you will see it all over your house. Brushing your dog once a day will greatly reduce the unwanted hair all over your clothes, carpet and furniture, especially during shedding season. .
1. Brush your pet daily. Besides giving you a mini bonding session with your pet, it’ll keep your four-legged friend’s coat healthy and tangle-free. 2. 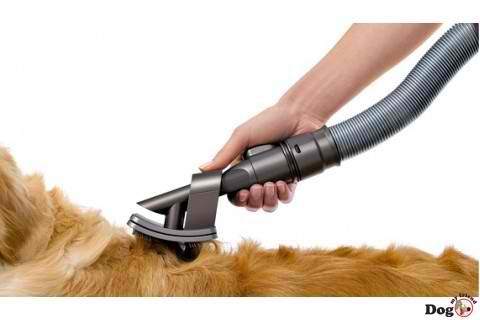 Vacuum every day. A little spin with the vacuum every day will keep the dust bunnies from breeding and multiplying. 3. Hang up all clothes right away—especially coats. While a shedding pet reinforces this important lesson from Mr. Rogers, it’s less likely that pet hair will make its way into a closet than on the floor and atop our wardrobe of wintery wools. 4. Don’t walk around barefoot. 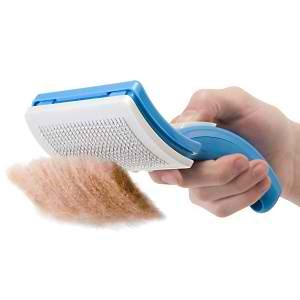 Your bare paws will pick up and distribute pet hair with remarkable speed. Invest in a nice pair of slippers. 5.Keep sticky-taped lint rollers everywhere you and your pet spend a lot of time. Also keep one in your desk drawer at work, one in your car, and one in your purse. Also, you can use a rubber glove, like the ones you use for dishes, to collect larger patches of loose fur, but keep in mind that this is more effective with cat fur than dog hair. If, no matter how often you vacuum, it seems as though your upholstered furniture is still covered with dog fur, try this easy solution. Dampen a piece of fabric—chamois works best, but any cotton rag will do—with some water and rub it over the fabric. Even excessive dog hair will come right off. No matter what method of fur removal you choose, you can make it even more effective by first spraying the affected area with some antistatic spray, such as Static Guard (which you can find at discount and grocery stores). To keep hairs off wool and fuzzy clothing—their favorite clinging places—try to pet dogs and say good-bye before you put on your coat to leave. Keep a large shirt around to drape over “dry clean only” suits and sweaters when you’re around the dogs or sitting in their favorite chairs. Always hang up coats and any other dry-cleaned clothing, preferably in a closed closet, and place sweaters in closed drawers. Dogs find these items irresistible when they are left lying around or are hung over the backs of chairs. And if your pooch indulges, you may not appreciate the resulting dry-cleaning bill—let alone the fact that your clothing might still have hairs on it when it comes back. SO what are the best ways to help Prevent Shedding? It appears that the more natural light your pet experiences, the more likely it is to shed in one or two discrete periods. This may not be the case in your pet – but it is worth a try. Seasonal changes in all animals are due to changes in the length of the day, not to changes in the weather. A good diet minimizes shedding. Be sure the pet food you feed contains adequate levels of protein, fats, vitamins and minerals. Most nationally marketed brands do. But if your pet receives a large portion of it’s diet in table scraps, try cutting those down. The body washes, fatty acid and vitamin sprays you can buy, only manage to moisturize your pet’s skin with the oils they contain. They do not help with shedding. The oral coat supplements of vitamins, fatty acids and other nutrients do not help a dog that is receiving a good diet. We have no real scientific evidence that Omega-3 fatty acid- containing products really reduce shedding. But some people think they do. They seem to have so many other positive benefits to health that you may wish to try them for your pet. Pets in good general health shed less than those that are not. Anything that makes your pet scratch will increase the amount of hair you find around the house. The most common causes are flees and allergies. 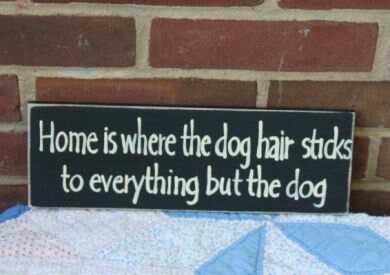 Brushing your pet frequently with the proper comb will remove the problem of hair around the house. This is the low-tech solution. I find it best if I use a comb which has teeth imbeded in a rubber backing (slicker comb). Many that are sold have the teeth too widely spaced. There is a proper size for each pet. Theses Suggestions comes from many sources…so I hope that they help!